. . . almsgiving is . . . a state of mind and of being, in which we recognize that all of our resources — material, intellectual, attitudinal, etc. — are precisely gifts, gifts given to us to help others, and most certainly not given for our own indulgence or gratification. It's not only hard to adopt that attitude, but it's hard to figure out how to do it right. Lent is a time for us to think in those kinds of terms, and to ask God to show us how. . . .
* Robert Heaney is the John A. Creighton University Professor and Professor of Medicine, School of Medicine, Creighton University. The quote is from Heaney's Lenten Presentation at CU on February 21, 2008. Heaney's online ministries bio is here. Can another week have gone by already? This column has received a wonderful response since I began it several weeks ago. It's even inspired a few sister bloggers, and maybe a few brothers, too, to go exploring. It's fun to put together, and sometimes surprises me with the gems I've uncovered as I pick up and follow a thread from here to there. It makes for a richly patterned quilt of connections. Ready to get out from under the covers? ✭ Augmented-reality mapping technology lets you broadcast your telepresence. A demonstration of the Microsoft technology is here. I think it's amazing. 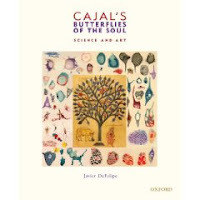 ✭ Cajal's Butterflies of the Soul, by Javier DeFelipe (2010, Oxford University Press), is one of the most beautiful and fascinating books published this year. The book (reviewed here) is named for Santiago Ramon y Cajal (1852 - 1934), known as the "father of modern neuroscience" and winner of the 1906 Nobel Prize in Medicine. Its drawings are inspired by 19th Century and early 20th Century scientific illustrations of the wonders discovered on experimental slides viewed under a microscope. Cajal, who wanted to be an artist, wrote that "only artists are attracted to science". Is it any wonder, given the beauty of the 282 unique images in this book? You don't have to be an artist to be inspired by this book. 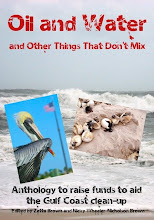 The images delight and astonish, and the text offers insights into what reviewer K.A. Jellinger called a "vision of science as an artistic and esthetic enterprise." A detailed description of the book is here. For a related item on an art exhibit, "Curious: the Craft of Microscopy", go here and here. ✭ Everyone is always going on so about time. Here's an arts and social media blog by Devon Smith that might inspire you to consider how you might spend 24 Usable Hours. ✭ You won't be able to get a word in edgewise but phone in here anyway to listen to a podcast with Frances Justine Post, the 2008 recipient of "Discovery"/The Boston Review Poetry Prize, and to read a short Q&A. Phone-in poetry podcasting is brilliant! The Episcopal Church & Visual Arts's newest exhibit, "Recognition & Return", is online now. Curated by The Reverend Catherine Quehl-Engel, chaplain of Cornell College and associate priest of Trinity Episcopal Church, Iowa City, Iowa, the show presents spiritually and artistically "mature" work from more than two dozen ECVA member artists, including Diane Walker, Roberta Karstetter, David Orth, and C. Robin Janning. ECVA's next call for entries for In Fellowship and Communion, is here. Submissions are due April 26. LaCarmen Tango is coming to Washington's Lisner Auditorium (730 21st St., N.W. ), March 6, for an international premiere performance of "love, passion, obsession and. . .tango". Choreographed by Alicia Orlando, with music by tango composer Raul Garello and Pan American Symphony Orchestra, LaCarmen Tango is set in Buenos Aires circa 1900 and features as principal dancers Alicia Orlando, Claudio Barneix, Alvaro Palau, and Arlington, Virginia's own Lucy Bowen McCauley of Bowen McCauley Dance Company. The performance is sponsored by GW Lisner Auditorium, Trinity Washington University, D.C. Commission on the Arts & the Humanities, the Embassy of Argentina, Ministerio de Relaciones Exteriores, and Comercio Internacional y Culto de la Republica Argentina. Tickets ($30 - $45) are available through TicketMaster or PayPal. Artween is the latest fully wired social network for artists, galleries, museums and foundations, art students, and plain folk who love art. You may register at no cost, create a personal page, and talk art with like-minded members. The site includes Weenart, described as the "first search engine of artworks" registered on Artween; News; ArtweenTV, which delivers art news and interviews with artists; and MarketPlace, which traffics in all things art, including job announcements and offers to exchange studios. Recently, I happened upon Art Heroes Thought Radio, subtitled "Conversations About Living and Working in the Arts". Host John T. Unger, a designer and professional artist known for his "fire bowls", says that his goal for AHTR is to help figure out how artists do what they do. To that end, he features every Thursday evening conversations with emerging and established artists, creative professionals, and experts in related fields. He goes behind the scenes to learn how artists build their careers, market themselves to success, and manage their artistic lives. On Tuesday evenings Unger devotes himself to call-in shows, each with its own pre-announced theme, such as pricing art, approaching galleries, or selling art online. A recent show was about promoting art on the radio. Art Heroes episodes are available free as downloadable podcasts or streaming audio. Transcripts of archived shows may be purchased individually or via subscription. To learn more about Unger and what he has to offer, go here. He's on Twitter and Facebook, posts images of his work on Flickr, and writes at I Got No Zen. I wrote last Friday about the Baltimore Craft Show in town through this weekend. If you go, be sure to check out the work of Washington State artists Allison Ciancibelli and Jeremy Newman of Twisp River Glass. Images from portfolios on their site will knock you out. Noland's official Website is here. For a wonderful remembrance of Kenneth Noland, see Mark Dagley's "Kenneth Noland" in The Brooklyn Rail. Last week, I featured the late poet Lucille Clifton. Continuing an appreciation for National African American History Month, I introduce you today to Robert Hayden, a much-celebrated poet and the first African American selected to be Consultant in Poetry to the Library of Congress, the position now titled Poet Laureate. Like Clifton, a poet he championed, Hayden, who was born in 1913 and died in 1980, drew deeply on his African American ancestry, culture, and especially history to craft elegant poems addressing "this freedom, this liberty, this beautiful and terrible thing"* for which all people dream. He began researching African American history in the 1930s for the Federal Writers' Project, finding in the story of slaves' journey from Africa to America a narrative on which he built a writing career, though he forcefully rejected being judged a "black poet". morning and keep on going and never turn back and keep on going. . . .
An adherent of the Baha'i faith, Hayden also wrote poems inspired by that religion, which espouses unity and universality, the belief that we are all creations of one God and part of one human family. Hayden devoted more than three decades of his life to teaching: 23 years at Fisk University (1946 - 1969) and 11 at the University of Michigan (1969 - 1980). He also taught at the University of Louisville and was a visiting poet at the University of Washington, University of Connecticut, and Denison University. His teaching, he said, allowed him to earn a living so that he could "write a poem or two now and then." A reading by Hayden of "Those Winter Sundays" may be heard here. (An interesting aspect about this poem is that Hayden is not writing about his genetic father.) The same poem can be read in full and heard here. Hayden's Selected Poems of 1966 brought him acclaim; he was deemed then "a major talent" and by the time of his Library of Congress appointment in 1976, he had earned a reputation as one of America's most eloquent and accomplished voices. He was elected to the American Academy of Poets in 1975. Among his 10 collections of poetry are Heart-Shape in the Dust (1940), Words in the Mourning Time (1970), Angle of Ascent: New and Selected Poems (1975), American Journal (1982), and Robert Hayden: Collected Poems (1985, 1996). He contributed to numerous periodicals, including Atlantic and Midwest Journal and, in the late 1930s, was the drama and music critic for the Michigan Chronicle. A biographical essay from The Oxford Companion to African American Literature (1997) is here. A critical essay on Hayden's poetry, including the poems quoted in this post, is here. * The lines "this freedom . . . this beautiful and terrible thing" are from the poem "Frederick Douglass". because she loved it so much and I am sure I will do the same. Maureen O'Kane, based in Wales, describes herself as "a professional public artist specializing in site-specific public art works in a variety of media." She works with mosaics primarily but also does casting in plaster, bronze and other materials, and creates concrete and mixed media relief murals and other sculptural pieces. Recently, she began creating medals that are purely art objects. Much to my delight, I discovered that O'Kane has an interest in animation and has produced two films, Unswept Floor and Dove Life. Both were the subject of a feature on the blog Mosaic Art Now. Both are truly inspired works of art, lyrical and playful and entrancing. Dove Life from maureen o'kane on Vimeo. 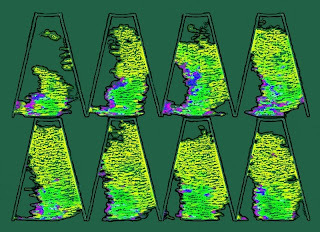 O'Kane's blog is Momosaic. You'll find there photos of O'Kane at work, as well as images of completed pieces, which are wonders to behold. A brief but excellent BBC interview with the artist is here. For information on Byzantine mosaics, go here. Information on where to find examples of Roman mosaics is here. Show me what kindness looks like. in one line of hope after another. Touch my wounds with kindness. what he could neither see nor make believe. Kindness never gets you an audience. Speak kindly of me when I'm gone. before turning red again with his single heart's pulse. Copyright © 2010 Maureen E. Doallas. All Rights Reserved. I wrote this poem for today's Blog Carnival and for Carry On Tuesday #41. The Blog Carnival, a biweekly online event open to anyone, is sponsored by Bridget Chumbley at One Word at a Time and Peter Pollock at Rediscovering the Church. Today's prompt is "kindness". Go here for a list of links to all of the contributions. Carry on Tuesday provides each week as a writing prompt a quote that is to be used wholly or partly in original prose or poetry. The prompt for February 23 is the opening line from Michael Crichton's 2004 novel State of Fear: "In the darkness, he touched her arm and said. . . ." Go here for a list of links to all of the participants' sites. to whose arms do you run to escape the sin? for whose sins must you be sorry? where do you create the space inside? how do you know how hunger feels? how do you learn to receive? by what clock do you watch sun rise and fall? what claim do you make on feast prepared? at whose altar do you sacrifice? how do you tell God's emptied Himself? out of what do you fashion your hope? what sign do you accept it's spring? from whom did you learn to sing? like justice, mercy, and love. Father Edward Hays is a Catholic priest, a spiritual guide, the co-founder of Forest of Peace Publishing, and the author of more than 30 books, including The Lenten Labyrinth: Daily Reflections for the Journey of Lent, Psalms for Zero Gravity, Feathers on the Wind, Meeting Christ at Broadway and Bethlehem, A Book of Wonders, Prayers for a Planetary Pilgrim, Pray All Ways, and Chasing Joy: Musings on Life in a Bittersweet World. In addition, Hays is a painter and illustrator (see some of his work here). Father Hays also writes a blog here. Once again, it's Saturday and time to show you where I've spent some little bits of my snow days in the last week. Where have your days gone? ✭ Take a moment to watch this trailer for Europa, East, a new film by Anita Doron that premiered at this year's International Film Festival Rotterdam. Viewing it is like watching poetry come to life on screen. Doron, a 2010 TED Fellow, is a surrealist filmmaker and documentarian. ✭ Jewelry that is not for the faint of heart gives Valentine's Day just passed a new twist. Since 2008, artist Lola Brooks has been crafting her tropes of love using ruby-red garnets, 14k gold, copper, vitreous enamel, stainless steel, diamonds, vintage rhinestones, and other materials that might surprise you. Brooks's work is as stunning as it is sometimes outrageous. Here's an interesting article on the artist from the February/March issue issue of American Craft. Images from her solo exhibition Sentimental Foolery may be seen here; images from her show Confection are viewable here. ✭ Looking for art underground? Go here. I promise you'll find enough on this site that you'll forget the clock's ticking. See, in particular, Linear: Dryden Goodwin, featuring 60 portraits of line staff on London Transport's Jubilee line. Now what's keeping my region's Metro system from doing the same? Art like this would sure beat dirty concrete walls and give us something more to consider than a jump in fares. ✭ Mark Rothko's The Seagram Murals are at Tate Liverpool. Wish I could see them! Since visiting the serenely meditative The Rothko Chapel in Houston, Texas, more than two decades ago, I've been struck by how gorgeous and emotion-packed Rothkos are. The nine paintings comprising the exhibit can be seen until March 21. Enjoy this, too. ✭ A fine piece of writing this is. The essay "Once a Writer, Always a Writer?" strikes the difference that separates writing as a job from writing as an "existential vocation". Rest in peace, J.D. Salinger. Artist Phoebe Greenberg discusses her film Next Floor (2008) at the Hirshhorn Museum on Thursday, February 25, 7:00 p.m. Conceived and produced by Greenberg and directed by Denis Villeneuve, Next Floor — a fascinating statement on society's excessive consumption (my husband and I saw the film some months ago) — won Best Short Film, International Critics' Week, at the 2008 Cannes Film Festival. The Hirshhorn's one-hour conversation with Greenberg is free. Additional information about the film is here; details on the talk are here. The American Craft Council is holding its annual winter show at the Baltimore (Maryland) Convention Center February 25-28. This is one of my favorite events; it is also exhausting (take comfortable shoes! ), because the number of fine craft artists who gather to display and sell their one-of-a-kind work usually exceeds 700. One highlight is the opportunity to meet and talk with the artists; another is to visit Demo Stage, which offers live demonstrations and hands-on projects (for example, "throwing" a pot, fusing glass to create jewelry, designing a greeting card) with some of the show's artists and local craft organizations, such as Baltimore Clayworks; and yet another is to take part in the Awards of Excellence Walking Tours, conducted by the show's jurors, who discuss what makes awardees' work so noteworthy. The show this year brings back School to Market, a section set aside for craft artists from Savannah College of Art and Design and Rhode Island School of Design; and AltCraft, a reserved marketplace-style space for 20 artists. For additional information, including craft categories, admission costs, and a New Exhibitors list, visit the show's Website. The ACC opens its show in the Cobb Galleria Centre in Atlanta, Georgia, March 11-14. Details are here. After that, it's on to St. Paul (April 16-18) and San Francisco (August 13-15). Last Saturday evening, my husband and I braved the snow and blustery winter winds to drive to Manassas for the opening reception for Myth & Mystery, a three-artist show at Caton Merchant Family Gallery. We delighted in making the acquaintance of Fairfax, Virginia, artist Kathleen Kendall, whose intimate mixed media work drew attention all night. Some of Kathleen's pieces combine oil painting and paper collage; others, such as her small icon-like portraits, are made from clay and layered with such "found" materials as beads, wrapping or other patterned papers, shells, lace, printers' letters, and maps. They are intricate and precise but not fussy. Full of symbols you needn't understand to appreciate them, the works often appear as though torn from a book about classical or Renaissance art. They're both dramatic and theatrical, mysterious and mythic, telling stories of their own that may or may not be complete. Their wonderful titles give only a clue to their narratives: "Like Taking the Black Off a Crow", "The Sphinz", "Abracadabra", "Fortune Teller", "Sirene", "Knot of Fools", and "Three Graces" (seen above, at left). As Kathleen says, "All of my work is concentrated in a language that is psychological and personal to me." Kathleen was the subject of an Elan magazine featured-artist profile in 2009. Read it here. The article highlights Kathleen's use of tissue paper to create a layered effect that does not add bulk and includes images of a number of her rather haunting and ethereal beauties. If you're in the area, don't miss this show! Work of the quality of the art of all three of the artists deserves to be seen by as many people as possible. And buy the work now, while it's still affordable. Do you regularly ship art from here to there? Listen up! Our Department of Homeland Security has a few rules for you. Go here to read the latest on DSH's new rule on air cargo, which has more than a few art world denizens complaining of headaches. You might also find Randy Kennedy's New York Times article on the rule a good read. The DHS mandate becomes effective August 1. The Washington, D.C., area often takes a bad rap for being "too inside the Beltway"—in politics and in the arts. Well, we don't all live inside the bubble; I'd even say most of us don't. Need proof? Go here. Contemporary artists from New York City, Los Angeles, and the D.C. area joining forces for a temporary art exhibition that just might land our area the kind of press the art scene here deserves. And now that the cat's out of the bag, keep spreading the news. If you're an artist and can't stand the silence in your studio, the Visual Artist Podcast Network may be the resource you're looking for. Launched this month, VAPN offers a choice of podcasts to keep you "informed, inspired, and entertained" while you're creating. Select one of the "channels" offering interviews or articles about painting, drawing, and story-telling; tutorials; a "process diary"; pop culture discussions; and news of what's going on in the arts community. VAPN also just announced it has joined forces with the Artcast Network, a directory of artists who broadcast their work on live Webcasts via streaming services (Ustream, Livestream, and others), so that you can also watch artists paint or draw in real time. Created by freelance illustrator Dani Jones (she's a professional illustrator of children's picture books, magazines, and educational materials), ArtCast encourages artists to submit their own Webcasts. This morning, Christine Valters Paintner of Abbey of the Arts wrote of and shared her contribution to the "first ever" Theoblogger Challenge at Patheos to write in 100 or fewer words an answer to the question "Who or What is God?" Christine, whose own response is here, invited her readers to write their own reflections and to post a link in her comment box, at the Patheos site, or on their own blogs. I decided to accept Christine's invitation, and after a few moments of quiet, the response above emerged. How would you give voice to the Theoblogger Challenge? Offer your answer in my comment box and then visit the Patheos Public Square, where the topic for the week is "Gods and Goddesses". as Traditionalist, as Liberal, as Muslim. In short, I invite viewers to resist stereotypes. She lives and works in New York. She was born in 1956 in Morocco. She represents both East and West. Her family is conservative and Muslim. Her education is European (Paris) and American (Boston). She's a painter, a photographer, an installation artist. Her name is known throughout the art world, and she is represented in many public and private collections. Her work crosses cultural boundaries, invokes art history, is at once personal and political, domestic and social. It reaches back to myths, unburdens stereotypes, upsets our thinking about gender, hierarchies and power, and traditions that limit as well as preserve. It's about the past —colonialism and independence — and also certainly about the present, about perspectives and attitudes — about women, by women, toward women, of women. And it's about confinement and freedom, constraint and control; about beauty and objectification; about the surface and what's lying below, the spaces within, between, and without. It's subversive and provocative; sensual and ritualistic; also exotic and mysterious. It's written all over. It's more than art: It's testimony, witness, documentation. Pictured at left: Moorish Woman, 2008, Chromogenic print mounted to aluminum and protected with Mactac luster laminate. Collection Lalla Essaydi. Copyright © Lalla Essaydi. Edwyn Houk Gallery (New York) and Howard Yezerski Gallery (Boston). Les Femmes du Maroc, an exhibition of 17 of Essaydi's photographs, opened January 30 at Jane Voorhees Zimmerli Art Museum, Rutgers, State University of New Jersey, New Brunswick. Organized by DeCordova Sculpture Park + Museum in Lincoln, Massachusetts, the show continues until June 6. 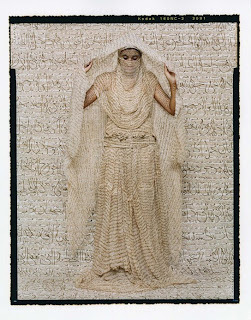 Like her contemporaries — Shirin Neshat (Iran), Shahzia Sikander (Pakistan), Ghada Amer (Egypt) — Essaydi is hailed a "feminist". Her extraordinary art, to my mind, defies so singular a label and connotation. It provokes too many thoughts, raises too many questions, contains too many contradictions, allows too many interpretations to be any one thing. As Essaydi herself says, "I invite viewers to resist stereotypes." The photographs in the exhibition all show women, either a single woman or a group of women; all but a few are veiled, and their clothing is layered, encumbering, both hiding and revealing, and unmistakably if somewhat unsettlingly beautiful. They and their ground (floor, cushions or other furnishings, drapery, and backdrop) are all of a piece, covered entirely by calligraphy, an art form that in Islamic countries until recently has been the province of men who transcribe sacred literature. The inscription in Essaydi's photographs, as in the image above, is in henna. Henna has long been used to "decorate" women's bodies, though it has many other uses, including medicinal; traditionally, henna painting has been deemed a woman's art. Thus, to use henna in calligraphy is to defy status quo, to enter space "owned" by men, to upset the already imbalanced scale that puts men on one side, women on another. Also, the text in the photographs is not from the Qur'an; nor is it sacred to anyone but the writer. It's culled from the artist's own journals and, according to gallery notes, speaks about memory, communication, cultural identity, self-identity, and personal freedom. It's Essaydi's private narrative exposed. This is art to linger over, talk about, argue over, be inspired by. It cannot leave you neutral. In 2011, North Carolina Museum of Art plans a mid-career survey of Essaydi's work. There are many informative articles on Essaydi and her fascinating work, including this one from 2007. This, from Tindouf Gallery Marrakech, shows additional images, including a photograph of Essaydi. Lisa Sette Gallery, in Scottsdale, Arizona, carries the artist's work, and offers an essay on the artist here. Essaydi's work also is featured in the Brooklyn Museum's Feminist Art Base. This YouTube video offers a view of Essaydi photographs in Indelible, a show last year at the Frist Center for the Visual Arts, in Nashville, Tennessee. An interesting art historian's perspective on Orientalism and the term "Islamic art" is here. Each of the items above has a relationship to the other that is uncovered in the 16-minute TED Talk that I'm sharing with you today. Each has to do with the need for lab tests for disease diagnosis in the most needy populations in undeveloped and developing countries. Each represents a creative and ingenious solution to the problem of manufacturing "dirt-cheap" medical testing devices that can be used without a doctor being present. Delivered by renowned chemist George Whitesides, the talk reveals the fascinating capability of the mind to come up with elegantly simple responses to complex human needs. Whitesides himself is something of a wonder. He leads the Whitesides Research Group at Harvard University, which explores nanotechnology, fluidic optics, magnetics, functional self-assembly, and a host of other subjects. He's co-authored more than 900 scientific articles and co-founded 12 companies. His name is on more than 50 patents. His nonprofit, Diagnostics for All, works closely with his research group to bring low-cost, easy-to-use, point-of-care diagnostic devices to developing nations.
. . . Just as the image of a word on paper can instantaneously conjure up powerful emotions (positive or negative), so to a cardiologist a second's glimpse at an echo image conveys volumes of information about the patient's disease and prognosis. The echo images that I see add in some unfathomable way a richness and another dimension to my thinking and imagination about the patient and myself. Cardiologist Joseph A. Gascho, M.D., reads pictures — echocardiograms ("echoes") — for a living. When he's not seeing, listening to, or examining patients to learn how well or how poorly their hearts are working, Gascho is making pictures of his own and linking the images he creates to poems he writes. Gascho is a story-teller — on and off the job. During office hours, Gascho listens to stories his patients tell him. He reads stories captured in the black and white and gray (and sometimes color) of patterns produced by high-frequency sound waves directed to and reflected back from hearts being tested. After looking at the still or moving pictures on a computer, he writes explanations to help give patients and their doctors a clue to a man's inability to catch a breath, a woman's swollen ankles, a grandfather's chest pain, a teenager's heart giving off the sound of whoosh instead of whish. Later, after his white coat has come off, Gascho re-sees, re-reads, and re-writes the pictures and words in his mind, transforming them in his imagination. He conjures new stories with the camera's eye and through his own; he writes new stories with words drawn from his own questions about his patients and himself. Like seeing a heart beating in an open chest cavity, Gascho's images can stun and his words move. And they are prompts: When we look at and read those images and words, we filter them to make them our own, to imagine our narrative of blues and reds and yellows pulsing on a screen, dipping, rising, falling flat before rising again. A few other Gascho images are here, where you can see one of his diastole images paired with a poem. The image and poem have been selected for publication. Take a peek, then come back and let me know what your favorites are. You might even want to write a story or a poem about seeing diastole up close. All images property of Joseph Gascho. Copyright © Joseph Gascho. All Rights Reserved. Diastole 6 and Diastole 9 published with permission. * Joseph Gascho, "Echos of a Doctor's Heart" in Journal of Medical Humanities (2009), 30:201-205. ** Diastole alternates with systole to form pulse; it's the part in the heart's rhythmic cycle when the heart relaxes and is filled with blood. I thank Jan Phillips for bringing Dr. Gascho's work to public attention. I wrote this poem for Abbey of the Arts Poetry Party #44, "Entering the Desert's Fire"; and for Carry On Tuesday's prompt for February 16, which comprises this quote from 19th Century poet Percy Bysshe Shelley's "To a Skylark": "Fear not for the future / Weep not for the past". Go here for the poems or the links to the poems collected for the Abbey's poetry party. The deadline for contributions is Friday, February 19. There will be a random drawing that day for a copy of Christine Valters Paintner's Sacred Poetry: An Invitation to Write. Go here for links to all the poems for Carry on Tuesday.
. . . carry you out / beyond the face of fear . . . .
February is National African American History Month in America, and every month is the best month to celebrate poetry. Today, I'm featuring the inspirational African American poet Lucille Clifton. Clifton, age 73, died Saturday, February 13, 2010, at Johns Hopkins University Hospital in Baltimore, Maryland. She had cancer and other illnesses. New York-born Lucille Clifton, winner of the 2000 National Book Award for Poetry, loved words all her life; her parents kept her and her siblings well-supplied with books and nurtured a deep appreciation for learning. Clifton took up poetry in the mid-1950s, while still a student, and began then to develop what became her signature style: free verse lyrics marked by use of allusion, repetition, minimal punctuation, puns, lowercase letters, and the most basic but evocative of words, a vernacular that celebrated her African American ancestry, history, and culture, as well as her own person. In 1969, Clifton won the YW-YMHA Poetry Center Discovery Award for work that poet Robert Hayden submitted on her behalf; that led to publication of her first collection, Good Times, which in turn brought her critical acclaim. She enjoyed a long and prolific career, rewarding her readers with words that could jump off a page and often startle when heard aloud. Clifton's 11 volumes of poetry include Good Woman: Poems and a Memoir 1969 - 1980, Blessing the Boats: New and Selected Poems 1988 - 2000 (the National Book Award winner, the first for work by an African American), Quilting: Poems 1987- 1990, the terrible stories, Mercy, and Next: New Poems. She also was the author of picture verse books for children, juvenile fiction, and memoir. Her Two-Headed Woman was a Pulitzer Prize nominee and winner of the Juniper Prize for Poetry. Maryland's Poet Laureate from 1979 to 1982, Clifton was awarded numerous fellowships, arts grants, honorary degrees, and other significant prizes, including the 2007 Ruth Lilly Poetry Prize. Clifton was distinguished professor of humanities at St. Mary's College of Maryland, where she held the endowed Landers Chair until she retired in 2008. Poetry is meant to be read, and to be heard. When shared by the poet herself, you feel the words as you do not when you see them on the page. Listen now as Clifton reads her powerful and powerfully delivered "won't you celebrate with me" (from The Book of Light, Copper Canyon Press, 1993). A PBS profile of the poet, audio of Clifton reading a 9/11 poem, and resources on Clifton are found here. A "Since You Asked. . . " video interview with Clifton, produced by WGBG, is here. I particularly like her statement that she wrote "with serious intent, which doesn't mean intending to be published; it means intending to try to do it well." A broadside of Clifton's "aunt jemima" is here. A Baltimore Sun obituary that appeared shortly after Clifton's death is here. Go here for "Hand in the Water", a tribute from my friend Deborah at Slow Muse. Meet me at 12th and Broadway? Not so much an invitation. But how could I refuse? How we read our love. This, I'm not so sure. some to seek our homes. sealing our two oft-bright visions. we read. Words to fill out our cloud. Complete Idiot's Guide to Numerology. where any of this was going. and spoke his last Tao Daily Meditations. Take your time. Go slow, and savor. Strand's been here since, well, forever. for Sports or Math, Comics or Military. It was enough, I thought. the Fiction and Lit, aaahh, Poetry. by waiting until what is dark becomes seeable. Mark Nepo is a poet, a philosopher, an essayist, a cancer survivor, and a spiritual writer. His books include The Exquisite Risk: Daring to Live an Authentic Life, Facing the Lion, Being the Lion, Surviving Has Made Me Crazy, and Unlearning Back to God: Essays on Inwardness, 1985-2005. Nepo's books of poetry are listed here. You will also find more than a dozen of his poems on his site. Weekly reflections from Nepo appear at Three Intentions. It's Saturday again and time to share some sites you might have missed during your spin this week on the Web. ✭ Art auctions may never be the same. On 140hours, original artworks, including photographs, are sold using Twitter. A special "140hours Valentine's Day Weekend" is going on now. Instructions on how to bid on the art using Twitter are provided on the homepage. You can find 140hours on FaceBook, too. ✭ Iconographer Caroline Furlong, who is listed in The Artists Registry of Episcopal Church & Visual Arts, views her art as a "visual language" that allows her to communicate "mystery [of] the ineffable kind". In a feature on Menachem Wecker's always interesting blog Iconia, Furlong says that she regards her work as sacred art, "because in creating we participate with God, the Creator of all things." Hers is a wonderful statement of our art-making gifts. Images of Furlong's recent works are here. Images of her lovely icons are here. Furlong is listed as a studio artist at Scottsdale's Xanadu Gallery and has a page on FineArtStudioOnline. A musician, Furlong lives in Houston, where she's director of contemporary music at Grace Episcopal Church. Her debut album was Wondrous Love. ✭ Word of Reflection Art Gallery & Studios, operated by the Art for Change Foundation in New Delhi, came to me by way of my blogging friend Jan Richardson, about whom I've written several posts. Reflection is no ordinary art gallery, and its name reflects its mission: to hold a mirror to call us to "look again", to create art with a social conscience. As its About page says, "And conscience has at its core the idea of human dignity, a fact which flows from each human being created as a reflection of the Divine. Conversely, beauty outside and the creative process within each of us reflect something uniquely profound about the Creator." In addition to an Artist-in-Residence program, the gallery and foundation sponsor an annual "Creative Conscience" workshop, as well as specialized workshops for persons who are "marginalized" in society, and offer art and social impact training and social issues seminars for students and adults. The gallery has a unique program to rent art. Currently on exhibition is artwork by children from the Windows Art Center, established in New Delhi in 2000 to promote creative, discovery-led education founded on observation and inquiry. ✭ Ever wonder why Vincent Van Gogh cut off his ear? The Art Newspaper has done a bit of sleuthing and thinks it's found a clue. And yes, it involves a fateful letter and brother Theo. Enough mystery! Go here for the "exclusive". ✭ Japanese aesthetics are the focus of Leonard Koren, artist, designer, architect, and author of Wabi-Sabi for Artists, Designers, Poets & Philosophers (the catalyst for this book was a tea ceremony), Gardens of Gravel and Sand (described as a "philosophical enquiry into Japanese rock gardens"), and Undesigning the Bath, among others. According to Koren, "Wabi-sabi is a beauty of things imperfect, impermanent, and incomplete. It is a beauty of things modest and humble. It is a beauty of things unconventional." Dirt and rock can be enough. A number on your own indivisible. what love leaves out brings in lets go. I'll take my place, you said I'm thankful. Paintings, photography, and video art created by 11 leading Turkish artists who are women comprise A Dream . . . but not Yours: Contemporary Art from Turkey, opening today at the National Museum of Women in the Arts (1250 New York Avenue, N.W., Washington, D.C. 20005). The show runs through May 16. Among the artists is Istanbul native Canan Senol, whose video Exemplary (2009) is featured. ♦ Kiki Smith: Sojurn, Brooklyn Museum, New York, through September 12. An article about the show, from The Art Newspaper, is here. ♦ George O'Keeffe: Abstraction, The Phillips Collection, Washington, D.C., through May 9. ♦ Pat Steir: Drawing Out of Line, Rhode Island School of Design, Providence, February 19 - July 3. ♦ Seductive Subversion Women Pop Artists: 1958-1968, University of the Arts, Philadelphia, through March 15. ♦ Reena Kallat + Sara Rahbar: Never Run Away, STUX Gallery, New York City, through March 20. Reena Saini Kallat was born in New Delhi and lives and works in Mumbai. Her work is exhibited all over the world. Sara Rahbar, born in Tehran, lives and works in both Iran and New York. Her art, too, is exhibited internationally. Both artists speak eloquently through their art. Founded in 1998 as a performing arts producer, Fractured Atlas (248 West 35th St., New York, New York 10001; 212-277-8020) transformed itself after 9/11 and re-emerged as a nonprofit arts service organization. Its purpose is to help artists and arts organizations function effectively as businesses by offering funding, healthcare, liability insurance of all kinds, workers' compensation insurance, online education and professional development programs, advocacy, and other services (such as assistance with international artist visas) that facilitate and promote art-making and outreach. More than 1,000 arts groups across the United States benefit from Fractured Atlas sponsorship; the membership of artists and arts groups exceeds 5,000, and more than 400 continue to join each month. Since 2003, Fractured Atlas has provided through its for-profit subsidiary, Gemini SBS, IT consulting and custom software development services for nonprofits and government agencies. Through its Open Arts Network, Fractured Atlas enables arts organizations to offer their own members access to the benefits and services Fractured Atlas provides. Information about programs and services for artists is here. A series of FAQs is here. Fractured Atlas is on FaceBook and Twitter. The Fractured Atlas blog is here. Arts-related news is here, where you'll find items not found elsewhere. I wrote about artist Tracey Clarke's exhibition, Myth & Mystery, here. The show's opening was supposed to be February 6 but had to be rescheduled because of the heavy snowfall in the region. The new date is tomorrow, February 13, 6:00 p.m. Details are here. Online, the New York Times has created a slideshow of 12 "Emerging Artists of the Decade". Eye Level blog recently featured the work of Lois Mailou Jones (1905 - 1998), who is represented in the collection of the Smithsonian American Art Museum. The wife of Haitian graphic designer Louis Vergniaud Pierre-Noel, she taught from 1930 to 1977 at Howard University, where she held the title Professor of Art. She painted her love for Haiti in such works as Eglise Saint Joseph. Jones's life and legacy were the subject of a Howard Magazine profile in 1999. Additional images are here. ". . . Oil painting is the greatest come-on ever devised. . . ." ~ Art Critic Jonathan Jones, on Kienholz: The Hoerengacht, at National Gallery, London. The focus of the exhibition of work by Nancy and Ed Kienholz, is Amsterdam's "red light" district. A poem I wrote about the exhibition after reading about it on the National's site is here.